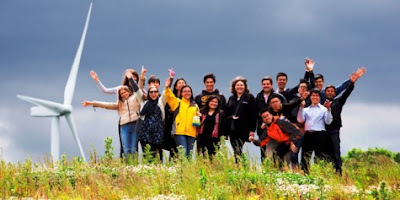 A visiting party of South East Asian students has been taking a look at a South Yorkshire wind farm as part of an overseas summer school project. The students from Ngee Ann Polytechnic in Singapore took a tour of the six-turbine Penny Hill wind farm, which is located to the south east of Rotherham and west of the junction of the M1 and M18, alongside representatives of the Barlborough-based business behind the scheme, Banks Renewables. Organised through the Faculty of Engineering at the University of Sheffield and University of Sheffield Enterprise (USE), the engineering students' visit to the site forms part of their studies towards an Overseas Merit Award that will eventually be counted towards their final degrees. The students who visited the Penny Hill site have been set the challenge of developing their own wind farm, and by the end of their visit to the UK, they will need to produce a technical report on what they would do, make a promotional video about their plans and give an oral presentation to fellow students and others involved with the project on their ideas. The summer school aims to engage the students in an engineering challenge that will also develop their enterprise skills, and to enable them to get the support of a relevant industry partner, so they can see engineering in action in an area relating to their project, get some input from the partner into their project and ask their approach to their challenge. Gary Wood, enterprise education developer at USE, said: "Programmes like these are so valuable for students, giving them a real insight into how engineering solutions work in real world environments, and as well as counting towards their degrees, it’s great for their own personal development too." Lewis Stokes, development relations coordinator at Banks Renewables, added: "We're very pleased to have been able to welcome the Ngee Ann students to our Penny Hill wind farm, and hope everything they saw and heard was useful to them for this project – we were certainly asked lots of questions on the day and we'll be interested to hear how the information they gathered will be used in the students’ final presentation. "We explained that the approach that we take to onshore wind farm development is very much focused on the local communities around our sites, and also on the economic, employment, social and supply chain benefits that we can bring to them through the projects that we develop. "The Penny Hill wind farm has worked extremely well in this respect, with local groups and good causes having already received over £40,000 in grants from the scheme's community benefits fund, and with many times that amount still to come in the future."